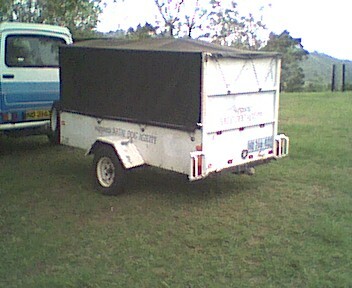 Just as an indication of how compact the equipment is, here are some photos of the trailer used by the KwaZulu Natal Dog Athletics Association. 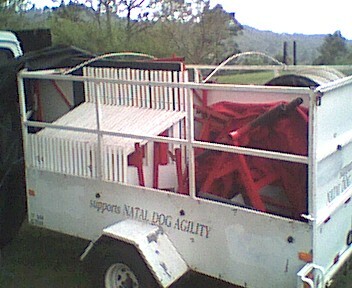 In the trailer is packed:- 12 sets of hurdles and crossbars, 'A' Ramp, Dog Walk, See-saw, Table, Tyre Jump, Long Jump, Weave Poles, Rigid Tunnel, Collapsible Tunnel, Start/Finish markers and all the small necessary bits and pieces. 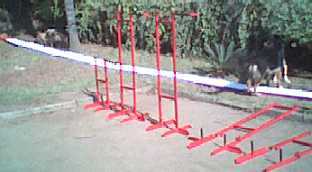 In addition, two Flyball machines and two sets of Flyball Hurdles are usually loaded as well. All of this in one trailer and towed by any light motor vehicle! 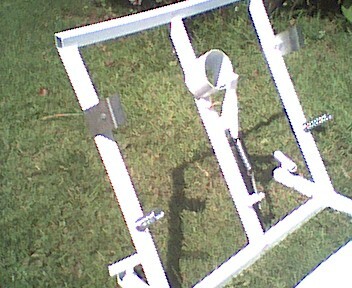 The upper picture shows the bases and the short and tall uprights before assembly. 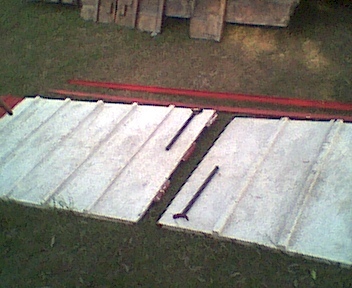 The lower picture shows the rest of the uprights assembled. The upper picture shows how during assembly, the locking pin supports the board before the next board is placed in position and the pin then goes through to the other side of the upright. 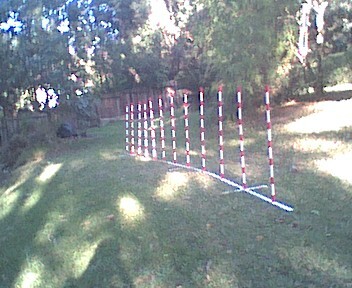 The lower picture shows the Dog Walk fully assembled. The connecting tubes, as seen clearly on the left board, are positioned together and locked with the pins shown. 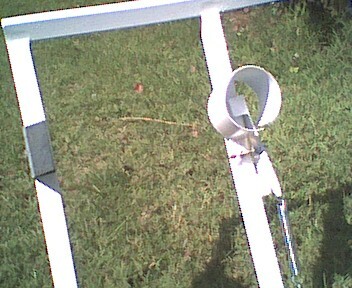 Once the pins are in place, the center section is raised and the two long red angle iron sections are located with wing nuts on the sides of each board to hold in position. 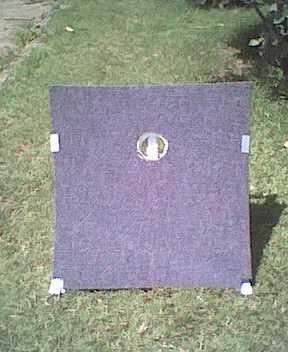 There are different position holes to cater for standard and mini dogs. As can be seen, the bases are flexible to conform to the contours of the ground. 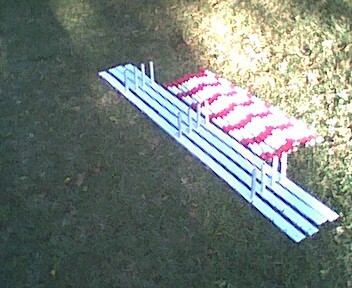 Above left is view of the tubes that the poles simply slip over. 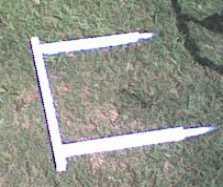 Bases and poles are supplied white, but poles are easily coloured using decal material. 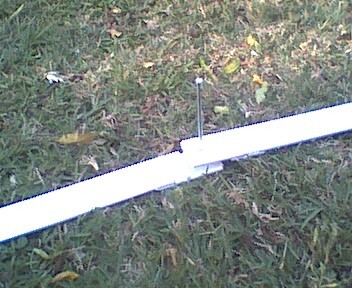 Above right is a view of an ordinary 6"nail that holds the bases together and fastens to the ground. Upper picture shows the release mechanism 'triggered'. 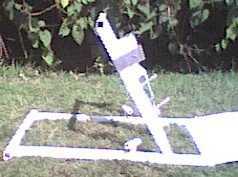 Lower picture shows the release mechanism 'loaded'. Upper picture is the detachable rear section, that has holes drilled for ordinary 6 inch nails to fasten in position. 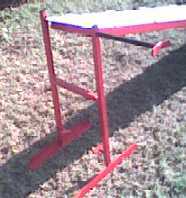 Or the ball loader can stand on this section to maintain position. Lower picture is a side view of the machine with the front board swung down. The board is 6mm phenol ply mounted on curved 20mm steel tubes. Upper picture is a front view of the machine, board covered with boat carpeting. 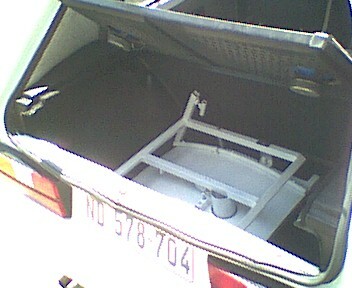 Lower picture shows compactness of machine, with rear section detached and underneath, in the trunk of a VW Golf. Two machines are able to fit in the Golf trunk, with space to spare.